The KONG Bounzer bounces and rolls in all directions when your dog plays with it. The handle on top makes it easier to throw or hold the toy during a game of tug. The Bounzer is made from flexible and lightweight rubber. The Bounzer has the well-known KONG shape just like the KONG Classic and the KONG Wobbler. The flexible and lightweight rubber bends whenever your dog picks up the Bounzer. Once your dog lets go of the toy, it will go back into its original shape. The handle makes it easier for you to throw or hold the toy during games of tug. 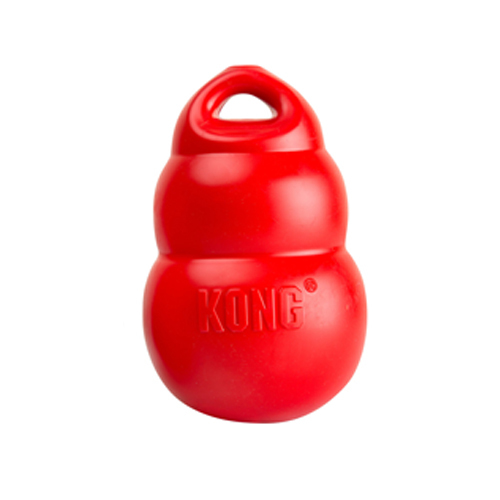 The KONG Bounzer is available in three sizes: medium, large and extra large. Have you used KONG Bounzer before? Let us know what you think about this product.